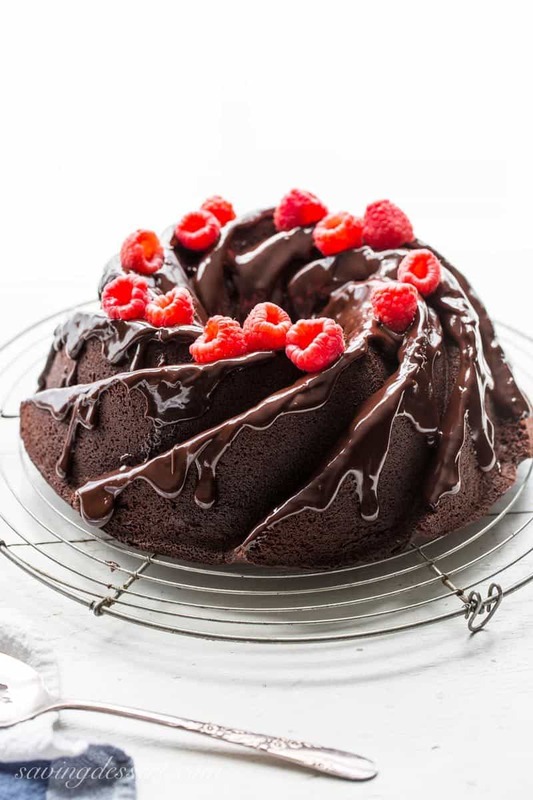 Chocolate Bundt Cake ~ a rich, moist, not too sweet cake with plenty of chocolate flavor and a little tang from the buttermilk. Drizzle with a simple glaze, or a dusting of powdered sugar for an easy, make-ahead cake sure to please your favorite chocolate lover! I’m embarrassed to tell you how many times I’ve made this cake. And, I’m not sure if all that tweaking was necessary or if I just wanted to make it again, and again. Either way, this final version (originally adapted from a recipe on Cook’s Country) is a keeper! 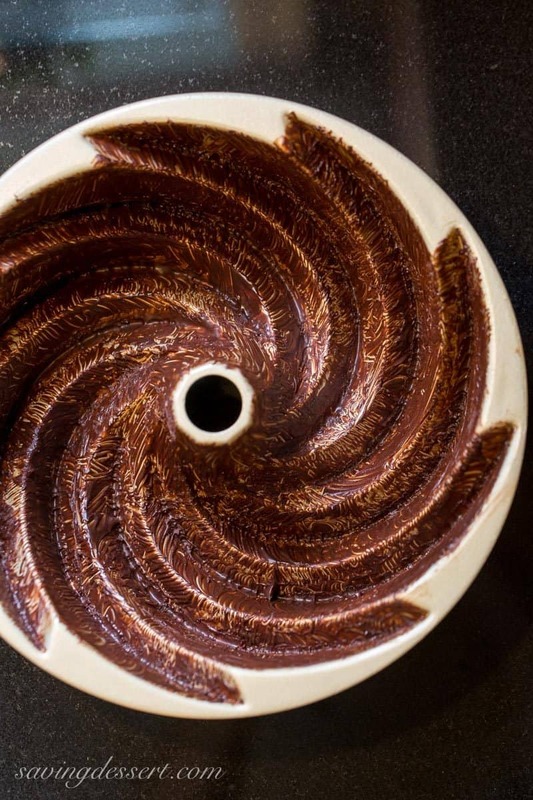 Cook’s Country shared an amazing tip/trick to ensure perfect cake release from your favorite bundt pan. I’ve tried it twice with great results so I’ll never skip this step when making a chocolate cake … never, ever, ever again. Just ask my family what the cake looked like when I didn’t use this method. When I served it at the last family dinner, we had to scoop it into bowls – one big giant mess! Sometimes vegetable sprays are worthless, just saying. This Nordic Ware Bundt Pan has a wonderful finish but the intricate design can cause problems if the pan is not well greased. The method is simple; melt butter in a small bowl in the microwave. Stir in cocoa powder then brush the interior of the pan with the butter mixture using a pastry brush. Although it takes a few minutes to ‘paint’ the interior, it’s worth every minute to ensure a great release. Brilliant! Shortcuts don’t always work in baking! One of my favorite things about this cake is the not-too sweet flavor. It’s chocolatey for sure, but not at all cloyingly sweet. The chocolate glaze is made with semi-sweet chocolate chips but you can use dark or milk chocolate if you prefer. Personally I don’t think you will want to skip the raspberries – they’re the perfect garnish in both color and taste. The tart, bright flavor really shines through so have extra on hand when serving. This recipe has been adapted to fit a 10-cup Bundt pan but it will work fine in a 12-cup pan too. TIP: The only way you can go wrong with this cake, is to over-bake it. It goes from ‘not-done-yet’ to ‘dry’ in about 5 minutes so keep a close watch on it. Test for doneness at the least amount of baking time. If the skewer or toothpick is covered with wet batter, then bake another 2-3 minutes and check again. Moist crumbs are what you want – but don’t assume it needs 5 more minutes – because it probably doesn’t. Just saying! We would love to connect with you on social media. If you try our recipe, please use the hashtag #savingroomfordessert on INSTAGRAM for a chance to be featured! And be sure to FOLLOW Saving Room for Dessert on FACEBOOK | INSTAGRAM| PINTEREST | TWITTER for all the latest recipes and updates. A rich, moist, not too sweet cake with plenty of chocolate flavor and a little tang from the buttermilk. Drizzle with a simple glaze, or a dusting of powdered sugar for an easy, make-ahead cake sure to please your favorite chocolate lover! Combine the melted butter and cocoa powder in a small bowl and stir until smooth. Using a pastry brush, paint the interior of a 10-cup Bundt pan with the mixture making sure to get it in the deep crevasses. If the butter hardens, microwave 5 or 10 seconds to melt and continue to brush on the pan. Set aside. Set the oven rack to the lower-middle position and preheat to 350 degrees. In a small mixing bowl, whisk together the flour, salt and baking soda. Set aside. If using a stand mixer, fit with the paddle attachment. Beat the butter, sugar and vanilla on medium-high speed until pale and fluffy. Reduce the speed to medium and add the eggs one at a time beating for 30 seconds after each addition. Scrape down the sides of the bowl with a spatula after two eggs have been added, taking care to reach down to the bottom of the bowl as well. Reduce the speed to medium-low and add 1/3 of the flour and half the chocolate-buttermilk mixture. Blend just until incorporated. Scrape the bowl well and add 1/2 of the remaining flour and all the remaining chocolate-buttermilk mixture. Blend again just until incorporated. Add the last of the flour and beat on medium-low until the batter is well blended, about 30 seconds. Pour the batter into the prepared pan and smooth the top evenly. Bake for 43-45 minutes or until a wooden skewer comes out with a few crumbs but no wet cake. Do not over bake the cake as it may end up dry and crumbly. Remove from the oven and cool on a rack for 15-20 minutes. Turn the cake out onto a parchment lined wire rack to cool completely. Add the chocolate chips to a medium bowl. In a small saucepan, heat the cream and salt to a simmer. Pour the hot cream over the chocolate chips and set aside for 60 seconds. Stir until the chocolate is completely melted. Cool for a few minutes then drizzle over the cake as desired. Garnish with fresh raspberries. If desired, sprinkle the cake with powdered sugar in place of the chocolate glaze. Store the cake in an airtight container at room temperature or in the refrigerator for longer storage. I really want to devour try this Cold Chocolate Snacking Cake from The View from Great Island. Who wouldn’t love a cake you can snack-on right out of the refrigerator!? 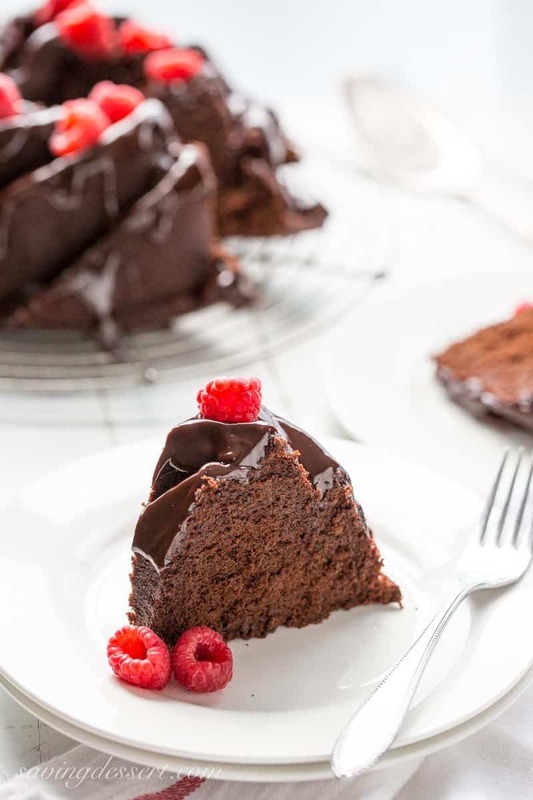 Love this One Bowl Chocolate Cake from Valerie’s Kitchen too – so many delicious recipes, so little time! These individual Hot Chocolate Pudding Cakes from Seasons & Suppers must be fantastic. They look wonderful and I can’t wait to try them. Thanks so much for stopping by! Have a wonderful weekend. Made this for my husband’s birthday yesterday. I’m an inexperienced baker so was thrilled when it was absolutely delicious! Baking time in my oven was 42 minutes. I could not find espresso powder in two large grocery stores, so I added a double shot of brewed espresso instead. Will definitely make it again. Thanks! Outstanding Maddy! Thanks so much for trying the recipe and for letting us know how it worked for you. Thanks again and happy baking! I made this today and it came out beautifully!! Great recipe. I’ll be making this one over and over again. Thank you! Yeah! Thank you so much for letting us know you liked it too. I think it even gets a little better after sitting overnight – but either way – it’s a tasty cake and I love that it’s not overly sweet. Thanks again for the feedback and for trying our recipe – woohoo! Thanks Liz – it really, really works well. Happy weekend! For reals – that is the coolest bundt cake pan I’ve ever seen! I love how the chocolate looks as if it’s winding around the cake. It’s s beautiful I almost don’t want to eat it! BWHAHAHAHAHAHA, yeah right, I would face plant into that tasty cake the moment someone left me alone with it. Seriously though, great job! That is the sweetest comment Christina! Thank you very much and thanks for stopping by! This is just stunning, Tricia, and my favorite ingredients!! Those raspberries are so perfect looking and that chocolate! I hope you frame a pic of this and hang it in your kitchen – it’s so you! Haha – thanks Robyn 🙂 I really do love to bake and how I wish you close by so I could share it with you. You could be an official taste tester! 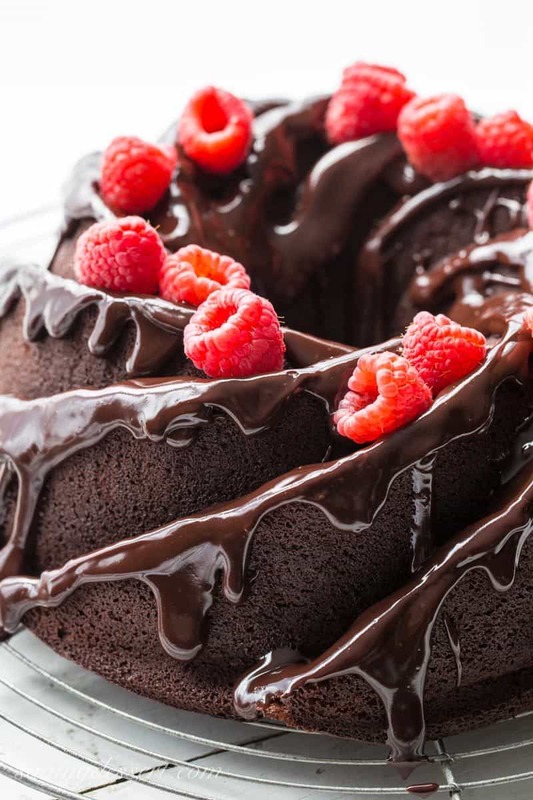 Wow that is one good-looking Chocolate Bundt Cake!! Excellent photos! I bet it tastes just as good as it looks! Great work!! Thank you so much Alia! 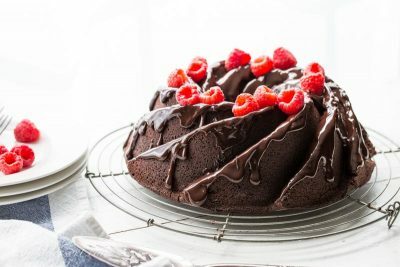 It is so easy to make too – nothing like a simple chocolate cake to make the family happy. That is one fantastic looking cake Tricia. Everything from the shape to the icing drizzle to the bright red berries. Thanks Larry – hope you’re having a wonderful trip! What a great tip for the bundt pan, Tricia! In my mind, there is nothing better than a delicious, chocolate dessert so this looks like pure bliss to me! Gorgeous! The cake has such a smooth tender crumb that I love and the bundt form is perfect! Drooling over this gorgeous cake Tricia! I have a question, what do you do for a vanilla based cake, do you mix flour with the butter to pain the pan? I have a lot of trouble with my older bundt pans not releasing, so I’m anxious to try! Thanks Sue – that’s a really great question. I think you’re right in assuming a paste made of butter and flour will do the trick. Let me know if you try it and I’ll let you know if I do. Thanks again! Thanks Jennifer! Bundt cakes are some of the easiest to make, and always a favorite. Have a lovely weekend! This is one gorgeous cake Tricia. Now you’ve got me craving chocolate for breakfast! But that’s not the worst thing in the world, is it!? Not a bad thing every now and than Chris – thank you! Sweet perfection. 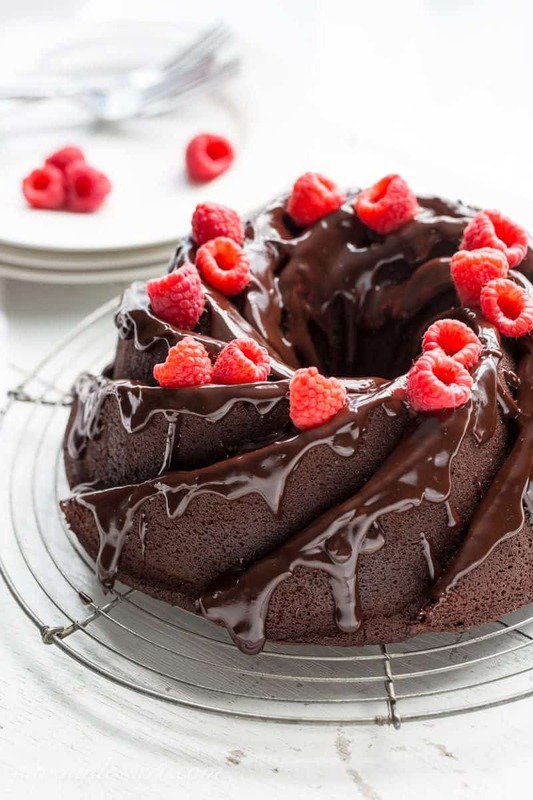 Nothing bundt love for this chocolate beauty! Hahaha Jessie – great pun!